In a large frying pan, cook the pancetta with the oil over moderate heat until beginning to crisp. Add the garlic and red-pepper flakes and cook, stirring, for 1 minute. In a large pot of boiling, salted water, cook the broccoli rabe until almost done, about 3 minutes. Drain. Add the broccoli rabe to the frying pan along with the salt and cook, stirring, for 2 minutes. In a large pot of boiling, salted water, cook the linguine until just done, about 12 minutes. 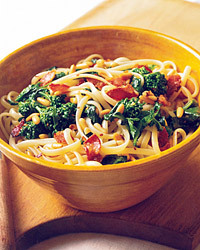 Drain and toss with the broccoli rabe and pine nuts. A crisp white wine is the best idea for this dish as it will cut through the salt of the meat and the richness of the nuts. Choose a Chenin-Blanc-based wine from the Loire Valley in France such as a Savennières or Anjou. Make sure it is dry (not demi-sec).